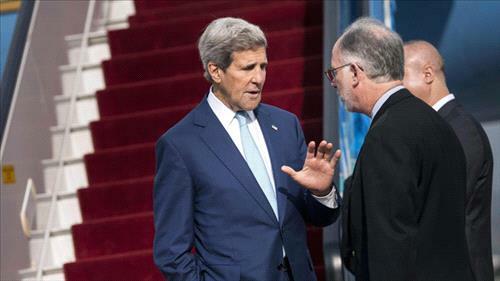 AMMONNEWS - U.S. Secretary of State John Kerry arrived to Paris on Saturday after visiting several countries in the Middle East, in a tour aimed at mobilizing support for President Obama’s plan to strike the Islamic State of Iraq and Syria (ISIS) militants, the BBC reported. Right before heading to Paris, Kerry visited Egypt, and described the critical role to be played by the country. “Egypt is on the frontline of the fight against terrorism, particularly when it comes to fighting extremist groups in Sinai,” Agence France-Presse quoted Kerry as telling a press conference with Egyptian Foreign Minister Sameh Shoukri. Since President Obama announced his strategy to fight ISIS on both sides of the Iraqi-Syrian border, Kerry has visited around 40 countries, including several Arab states to ensure their participation and support of the U.S.-led coalition set to fight the extremists, which now control large parts of Iraq, with their stronghold being in Syria’s eastern city of Raqqa. However, the U.S. opposed Iran’s participation in the coalition, calling it “not appropriate,” because of its stances on Syria and elsewhere. Kerry won on Thursday backing for a “coordinated military campaign” against Islamic State from 10 Arab countries, including Egypt, Iraq, Jordan, Lebanon and six Gulf states including Saudi Arabia and Qatar, according to Reuters. French President Francois Hollande will welcome diplomats from up to 20 countries on Monday for a security summit; the conference comes ahead of a U.N. Security Council meeting next week, and a heads of state meeting at the UN General Assembly later this month.